In 1991, University of Utah chemist Joel Miller developed the first magnet with carbon-based, or organic, components that was stable at room temperature. It was a great advance in magnetics, and he's been exploring the applications ever since. Twenty-five years later, physicists Christoph Boehme and Valy Vardeny demonstrated a method to convert quantum waves into electrical current. They too, knew they'd discovered something important, but didn't know its application. Now those technologies have come together and could be the first step towards a new generation of faster, more efficient and more flexible electronics. Working together, Miller, Boehme, Vardeny and their colleagues have shown that an organic-based magnet can carry waves of quantum mechanical magnetization, called magnons, and convert those waves to electrical signals. It's a breakthrough for the field of magnonics (electronic systems that use magnons instead of electrons) because magnons had previously been sent through inorganic materials that are more difficult to handle. "Going to these organic materials, we have an opportunity to push magnonics into an area that is more controllable than inorganic materials," Miller says. Their results are published today in Nature Materials. Find this release and images here. The release is password-protected until the embargo lifts. The password is W4ve. Once the embargo lifts, find the full study here. Before proceeding, let's talk about what a magnon is and how it can be used in electronics. Current electronics use electrons to carry information along wires. Magnons can also conduct information through materials, but instead of being composed of electrons, magnons are waves composed of a quantum property called spin. Imagine a football stadium, packed full of enthusiastic fans holding up their arms to cheer on their team. Let's say that the direction in which their arms point is their spin orientation. If every fan holds their arms straight up in the air simultaneously, then everyone's spin orientation is the same and they've made, in essence, a magnet. Now the crowd starts "The Wave," except instead of standing and sitting, one aisle of fans tilts their arms to the right. The next aisle picks up on this change in spin and passes it along to the next row. Before long, this magnet has a spin-based wave coursing around the stadium. The quantum version of the spin-based wave is a magnon. "Now you have a way to broadcast information in a material," says physics professor and paper co-author Boehme. "You can think about magnonics like electronics. You have circuitry and when you manage to build digital logic out of this, you can also build computers." Well, not yet. Although magnons have been known to science for decades, only recently has their potential for building electronics been realized. Currently, most magnonics researchers are using yttrium iron garnet (YIG) as their wave carrier material. It's expensive and difficult to produce, especially as a thin film or wire. Boehme says he once considered incorporating YIG into one of his instruments and had to give up because the material proved so problematic to handle that particular application. Boehme and Vardeny, distinguished professor of physics, also study the field of alternatives to electronics called spintronics, of which magnonics is a subfield. In 2016 they showed how to straightforwardly observe the "inverse spin Hall effect," a way to convert spin waves into electrical current. They began working together with Miller through a National Science Foundation-funded Materials Research Science and Engineering Center (MRSEC) at the University of Utah. In 1991, Miller had produced the first magnetic material using organic, or carbon-based, components. The three decided to test Miller's organic magnet to see if it could be used as an alternative to YIG in magnonics materials. They tested for electron spin resonance (ESR), a measure of how long magnons would last in the material. The narrower the ESR line, the longer-lived the magnons. The line was very narrow indeed, Vardeny says. "It's a record narrow line." But working with the organic-based magnet, known as vanadium tetracyanoethylene or V(TCNE)x, still presented some challenges. The material is highly sensitive to oxygen, akin to rare-earth magnets. "If it's freshly made, it'll likely catch fire," Miller says. "It'll lose its magnetism." 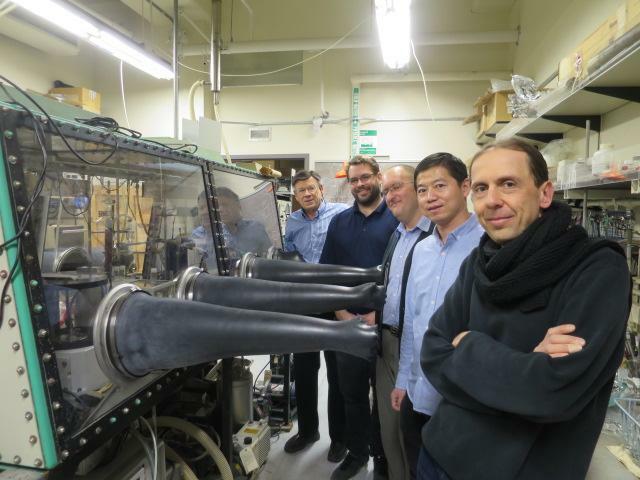 The team needed to handle the thin films of V(TCNE)x under low-oxygen conditions. Conducting experiments required a concert of activity, with members of the research team each at their right place at the right time to carry on the next phase of the experiment. "Count the number of authors on the paper," Boehme says. (There are 14.) "Every time we carried out an experiment, everyone had to stand there and be ready on time to participate in this process." It began with one of Miller's students arriving at 4 a.m. to prepare a precursor material and continued for two to three days continuously as research teams passed the baton of material and data. Not every experimental run was successful. Early on, the team learned that the copper connector they were using to convert magnons into electricity using the inverse spin Hall effect was reacting with the V(TCNE)x and thus wouldn't work. A switch to platinum contacts in the next run was successful. In the end, the team reported that they were able to generate stable magnons in organic magnets and convert those spin waves into electrical signals — a major stepping stone. The stability of the magnons in the V(TCNE)x was as good as that in YIG. The researchers are hopeful that this advance leads to more progress towards magnonics replacing electronics, since magnonic systems could be smaller and faster than current systems with less heat loss and much less energy required. Conventional electronics operate on a scale of volts, Boehme says. Magnons operate on a scale of millivolts, containing around 1,000 times less energy. The team next hopes to work toward magnonic circuits using V(TCNE)x, and also test other materials. "There are many organic-based magnets," Boehme says. "There's no reason to believe that if you randomly pick one, it's necessarily the best." It's yet to be seen, though, what the promise of magnonics might bring beyond faster, smaller and more efficient electronics. "We can't anticipate," Miller says, "what we can't anticipate."